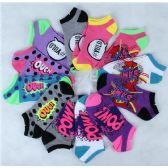 60 Units of SOCKS'NBULK Women's No Show Socks, Soft Sports Socks In Bulk - Womens Ankle Sock at low wholesale prices. alltimetrading.com offers Womens Ankle Sock at bulk discounted prices. SKU: 1294315 Free same day shipping.